There is one school of thought that says that when shopping for dog kennels, get the size that will suit your dog when full-grown rather than the size they are as a puppy. While it is true that method will save you money as you don’t need to buy more than one kennel, keep in mind that when a kennel is too large, it can make your pet feel unsafe. Puppies may seem like they think they are invincible as they frolic around, getting in all sorts of trouble, but they can feel overwhelmed by dog kennels that are far too large. Remember, however, that one that is too small won’t do either, so be careful to upgrade to a large one when your puppy outgrows the first one. If you want to avoid buying more than one kennel, consider one that is large enough for their anticipated adult size and use a divider to temporarily reduce its size. If you are already to the adult stage or you’ve just brought home a rescue dog and you are shopping for dog kennels, you can skip the smaller one and move right into the right size for them. To determine that, measure your dog from nose to the base of the tail and add 2 to 4 inches to get the smallest kennel length you should go with. Then, measure from the ground to the top of your dog’s head at whichever height is highest, sitting or standing, and again add 2 to 4 inches to determine the height for the kennel. If you have trouble finding dog kennels that are of the quality and size you want, consider custom dog kennels. A great source for dog kennels is here at Dogs By Andy K-9 Services. We offer aluminum kennels in single and double sizes, as well as custom sizes. Please contact us for a quote if you are interested in a custom size. 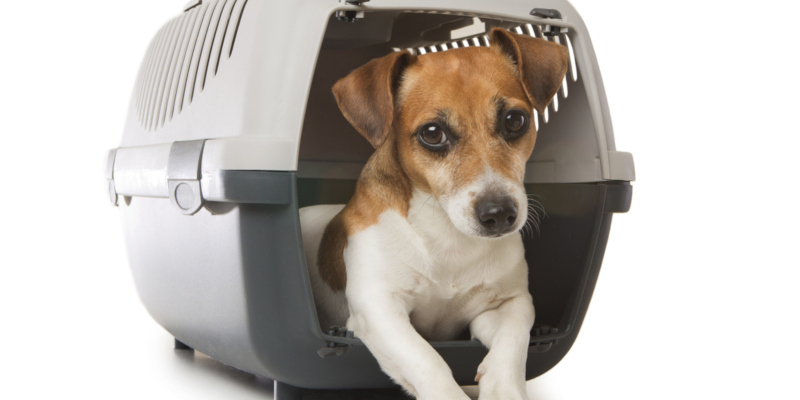 We also carry the VARI-Kennel 500 Series kennel crate with detachable wheels and three handles. Our aluminum dog kennels and kennel crates are available for local pick-up only.